In 2018, XTB reported PLN 101 471 thousand of consolidated net profit compared to PLN 92 973 thousand profit a year earlier. This is an increase of PLN 8 498 thousand ie. 9.1%. Operating profit (EBIT) decreased y/y by PLN 12 461 thousand 9.7% to PLN 115 809 thousand. Consolidated revenues amounted to PLN 288 301 thousand to PLN 273 767 thousand a year earlier. The revenues in 2018 increased by 5.3% y/y ie. PLN 14 534 thousand from PLN 273 767 thousand to PLN 288 301thousand. In the I half of 2018 XTB noted a record revenues (PLN 197 937 thousand), which resulted from the constantly growing customer base, clear trends in the financial markets, relatively high profitability per lot (an average of PLN 153) and significant customer activity expressed in the number of contracts in lots ( 1 291 426 lots). II half of 2018 brought reduction of revenues to the level of PLN 90 364 thousand, calmer situation in the financial markets, decreased profitability per lot (an average of PLN 116) and a decline of trading lots volume to 803 987 lots. 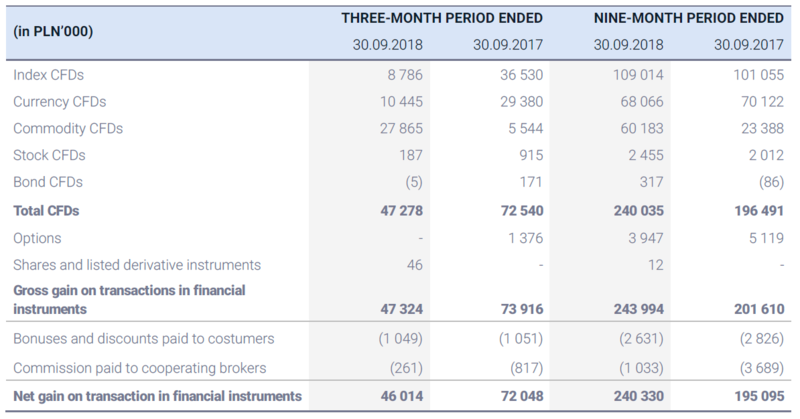 One of the relevant factors which determined the level of revenues of XTB in 2018 was the product intervention of the European Securities and Markets Authority (ESMA) coming into force in August, which in case of the retail clients limited maximum permitted level of leverage for CFDs up to 30:1 for major currency pairs and 20:1 for non-majors currency pairs, gold and major indices. Intervention was initially implemented for the period of three months with possibility of further extension. At present, it is known that the intervention will remain in force at least till April, 2019. Although in quarterly terms, the revenues of the XTB Group are subject to significant fluctuations, which is a phenomenon typical of the XTB business model, then in a longer time horizon, which is a year, they take on more stable and comparable values to those from historical years. XTB has a solid basis for growth in the form of constantly growing customer base and number of active clients. In 2018 Group canvassed 20 672 new clients, it’s increase by 9.3% y/y. The average number of active clients was higher by 2 612, ie. 14.0% y/y. In IV quarter 2018 XTB noted a record number of new clients in relation to previous quarters. In 2018, XTB continued implementation of optimized sales and marketing strategy and introduced new products such as shares and ETFs from the largest stock exchanges in Europe and the United States. Expanding XTB’s offer is a reaction to clients changing investment preferences, which include the increasing popularity of shares and ETFs. XTB’s aim is to provide a diversified investment offer simultaneously with comfort of managing the differentiated portfolio on one trading platform. The company analyzes other possibilities of expanding the product offer, which could cause the introduction of new products in 2019. In 2019 the Management Board will strive to growing customer base. The Management sees the greatest growth potential in the German, French and Latin American market. 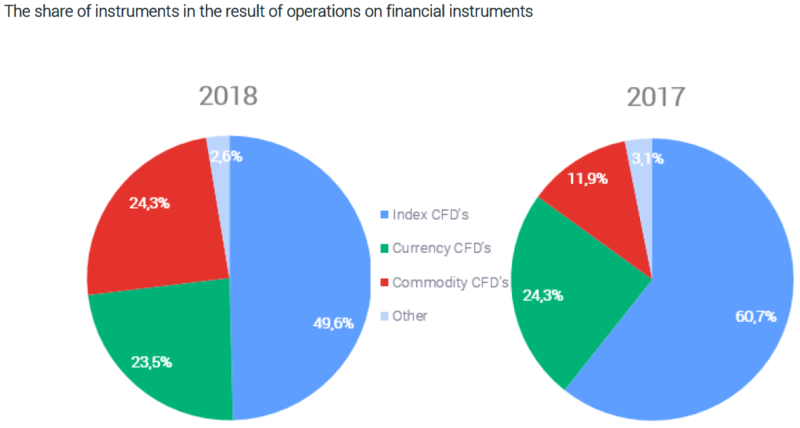 Looking at revenues in terms of the classes of instruments responsible for their creation, it can be seen that similar as in 2017, CFDs based on stock indices dominated. Their share in the structure of revenues on financial instruments in 2018 reached 49.6% against 60.7% year earlier. This is a consequence of the high interest of XTB clients in CFD instruments based on the German DAX stock index (DE30) and the US indices US100, US30, US500. The second most-profitable class of assets were CFD commodities. Their share in the structure of revenues on financial instruments in 2018 reached 24.3% (2017: 11.9%).The most lucrative instrument among customers was CFD based on quotations of the contract for oil and gold. Revenues on CFD instruments based on currency pairs amounted to 23.5% of total revenues against 24.3% a year earlier. Among this class of instruments, the USDTRY currency pair was the most popular between XTB clients. Geographically, XTB revenues were well diversified. In 2018 their growth has occurred in both, Central and Eastern Europe, Western Europe and Latin America. Country from which the Group derives more than 15% of revenues is Poland with shares amounting to 25.2% (2017: 28.6%). The second largest market for XTB is Spain, with shares amounting to 14.7% (2017: 20.7%). The share of other countries in the geographical structure of revenues does not exceed in any case 15%. Latin America is also gaining on importance, which has already replaced the gap in Turkey. XTB puts strong emphasis on diversification of segment revenues. Therefore, from 2013, it develops institutional activities (X Open Hub), under which it provides liquidity and technology to other financial institutions, including brokerage houses. Revenues from this segment are subject to significant fluctuations from quarter to quarter, analogically to the retail segment, which is typical for the business model adopted by the Group. PLN 16.7 thousand and increased in comparison to previous year (2017: PLN 15.7 thousand). – IT systems and licenses (increased by PLN 627 thousand y/y). In IV Quarter of 2018 operating expenses amounted on similar level as previous quarters of 2018 (after correcting by one-off event). XTB has a stable market position, growing customer base and over PLN 465 million of own cash on the balance sheet. The Group plans further development by expanding the customer base and product offer, penetrating existing markets and expanding geographically to new markets in Africa and Asia, as well as Latin America, using its presence in Belize as a starting point for expansion and business development in other countries of the region. The entry into force of product intervention by ESMA creates both opportunities and threats for XTB. 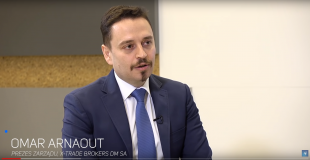 On the one hand, there is a temporary drop in trade volumes among European brokers. On the other hand, the Management Board of XTB is convinced of the business’s vitality over a longer time horizon. It seems likely that clients gradually adjust their trading strategies to a lower level of financial leverage. Maintaining the ESMA decision in time should lead to a wave of consolidation in the market and allow XTB to consolidate its strong position on the European market. In the III quarter of 2018, XTB noted consolidated net loss of PLN 2,9 million against PLN 31,3 million profit a year earlier. The III quarter of 2018 result was charged with a one-off event, which was the imposition of an administrative fine by the PFSA in the amount of PLN 9,9 million of which the Company informed in the current report No. 20/2018 dated 18 September 2018. After correcting by a one-off event, in the III quarter of 2018, the Company generated PLN 6,2 million of consolidated net profit and PLN 7,9 million of operating profit (EBIT). Consolidated revenues amounted to PLN 47,6 million compared to PLN 73,1 million a year earlier. In the period I-III quarter of 2018, XTB generated consolidated net profit of PLN 97,5 million (after correcting by one-off event PLN 107,1 million) against PLN 60,7 million profit a year earlier. 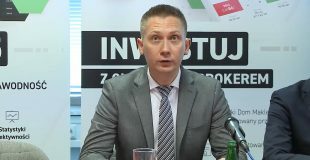 In the I half of 2018 XTB noted a record revenues (PLN 197,9 million), which were the result the constantly growing customer base, high volatility in the financial markets, relatively high profitability per lot (an average of PLN 153) and significant customer activity expressed in the number of contracts in lots. In August 2018, the product intervention of the European Securities and Markets Authority (ESMA) came into force. which caused, among others reduction for the retail client of the maximum permitted level of leverage for CFDs up to 30:1 for major currency pairs and 20:1 for non-majors currency pairs, gold and major indices. ESMA’s decision together with the holiday period, and the lower volatility on the financial markets, contributed to the reduction in the III quarter of 2018 transactions volume in lots of 34,1% y/y and 44,0% q/q. Volume was lower by 178,7 thousand of lots y/y and unit profitability by PLN 1,7. Consequently, the revenues decreased by 34,9% y/y ie (PLN 25,5 million) from PLN 73,1 million to PLN 47,6 million. It should be emphasized that XTB business model is characterized by high volatility of revenues in a short period of time. XTB has a solid basis for growth in the form of constantly growing customer base and number of active clients. In the III quarter of 2018 the number of new clients was 4 884 and was higher by 16,3% y/y. The average number of active clients was higher by 2 014, ie. 11,0% y/y. Similarly to the prior quarters of current and previous year, in the III quarter of 2018, XTB implemented an optimized sales and marketing strategy and introduced new products. XTB’s offer has expanded to include shares and ETFs from the largest stock exchanges in Europe and the United States. The aim of expanding the product offer is to create a complete investment company offering various products to investors tailored to their risk appetite. In the IV quarter of 2018, the Management Board will strive to stabilize the number of new clients and the average number of active clients at the levels observed in previous, record quarters. The Management sees the greatest growth potential in the German, French and Latin American market. 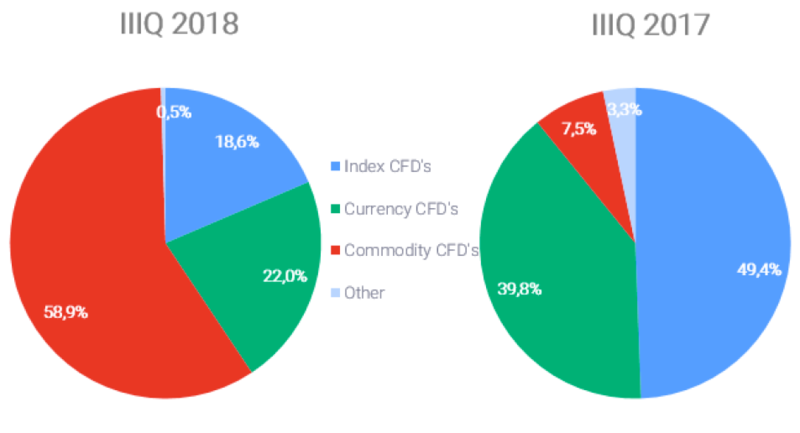 Looking at revenues in terms of the classes of instruments responsible for their creation, it can be seen that, in the III quarter of 2018, CFDs based on commodity dominated. Their share in the structure of revenues on financial instruments in the III quarter of 2018 was 58,9% against 7,5% a year earlier. 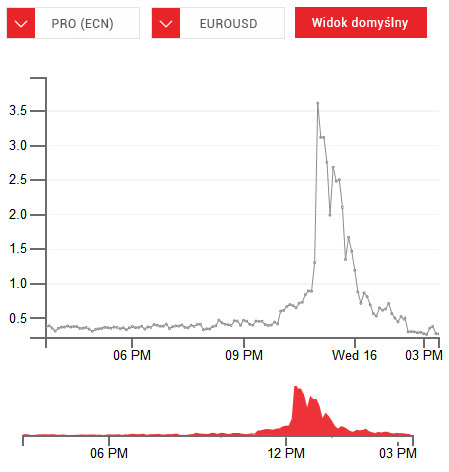 The most popular instrument among customers was CFD based on quotations of the contract for coffee quoted on the regulated market and an instrument which price is based on quotations of troy ounce of gold on the interbank market. 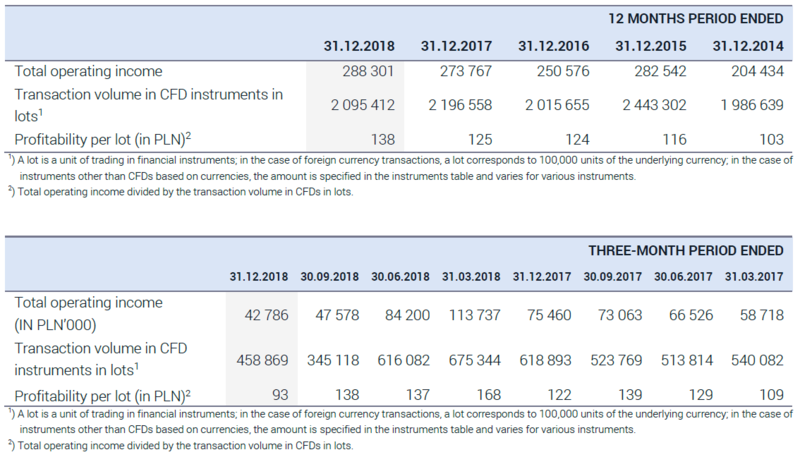 Revenues on CFD instruments based on currency pairs amounted to 22,0% of total revenues against 39,8% a year earlier. Among this class of instruments, the USDTRY currency pair was the most popular among XTB clients. Geographically, XTB revenues were well diversified. In the I-III period of 2018 their growth has occurred in both, Central and Eastern Europe, Western Europe and Latin America. Country from which the Group derives more than 15% of revenues is Poland with shares amounting to 33,5% (I-III period of 2017: 24,5%). The second largest market for XTB is Spain, with shares amounting to 14,5% (I-III period of 2017: 20,3%). The share of other countries in the geographical structure of revenues does not exceed in any case 15%. Latin America is also gaining on importance, which has already replaced the gap in Turkey. • PLN 1,8 million of commission costs resulting from higher amounts paid to payment service providers through which clients deposit their funds to transaction accounts. In the Company’s opinion, the imposition of an administrative fine by PFSA is unjustified and not confirmed in the facts. The Commission refused to carry out the evidence requested by the Company (including the expert’s opinion) and did not include the reports of independent experts submitted by the Company. Acting in the interest of the Company and its shareholders, as well as being guided by the welfare of its clients, the Company appealed the decision by filing on 29 October 2018 complaint against the PFSA decision to Provincial Administrative Court. In terms of q/q, after correcting by one-off event, operating expenses were reduced by PLN 2,1 million ie 4,9%. The Management Board expects in IV quarter of 2018 operating expenses to be at a level comparable to that observed in the previous quarter of 2018. The final level will depend on the variable remuneration elements paid to employees, the level of marketing expenditures and the impact of ESMA’s product intervention on the level of revenues generated by the Group. The value of variable remuneration components will be influenced by the results of the Group. The level of marketing expenditures will depend on the impact of the results and profitability of the Group and on responsiveness of the customers to the actions taken. The impact of ESMA’s product intervention on the Group’s revenues will determine, if necessary, a revision of the cost assumptions for further months of this year. XTB has a stable market position, growing customer base and over PLN 500 million of own cash on the balance sheet. The Group plans further development by expanding the customer base and product offer, penetrating existing markets and expanding geographically to new markets in Africa and Asia, as well as Latin America, using its presence in Belize as a starting point for expansion and business development in other countries of the region. The entry into force of product intervention by ESMA creates both opportunities and threats for XTB. On the one hand, there is a temporary drop in trade volumes among European brokers. On the other hand, the Management Board of XTB is convinced of the business’s vitality over a longer time horizon. It seems likely that clients gradually adjust their trading strategies to a lower level of financial leverage. Maintaining the ESMA decision in time should lead to a wave of consolidation in the market and allow XTB to consolidate its leading position on the European market. With reference to the announcement from the 404th meeting of the Polish Financial Supervision Authority (KNF) on 18 September 2018, the Management Board of XTB fully maintains its previous position and finds no grounds for objections regarding the company’s operations. During the proceedings before the KNF, the Management Board provided the supervisor with extensive explanations as well as legal and quantitative expert opinions of independent entities that confirm that XTB’s use of the asymmetric deviation mechanism did not violate the principle of acting in the best interests of the clients and did not affect the clients’ transaction results. KNF’s comments on the application of this mechanism pertain to operations from January 2014 to May 2015. The guideline regarding the need for symmetrical deviation was issued by the KNF in May 2016, almost a year after the company made voluntary amendments in its IT systems. Acting in the interest of the company and its shareholders, as well as being guided by the well being of its clients, the company intends to appeal against the decision of the supervisor.